The practice of SEO is a fairly results oriented business. Increasingly, metrics dominate the focus of the SEO professional, whether rank, traffic, or conversions. While a move to more measurement is overall a good thing, it means that SEO professionals are increasingly head down, focused on the things – like link building, on-page optimization, and content creation – that they believe will move the metrics needle. A byproduct of a focus on tactics that can be closely tied to metrics is that activities that are perceived to not produce an immediate impact are often left undone. One example of just such an activity is competitive analysis. Some SEOs don’t do it at all, either for the reasons described above, or because their thinking goes: It doesn’t matter who my competitors are or what they are doing, I’m just going to focus on moving my keywords up the rankings. Others do it very rudimentarily, giving a quick look on the SERPs for the handful of competitors they know about. Focusing on tactics that are perceived to produce results makes sense, but we’re going to use this article to make the case that, done right, spending time understanding and tracking trends in your competitive landscape will, in fact, have a positive impact on the metrics you care about. And, we’ll show how, aside from the metric gains you’ll generate, increasing insight into your competitive landscape will have the added benefit of making you a more informed marketer. To make the case, we’re going to introduce our hero ‘Ann’, the SEO manager for Acme Co., a medium-sized clothing retailer with both a brick-and-mortar and online presence. 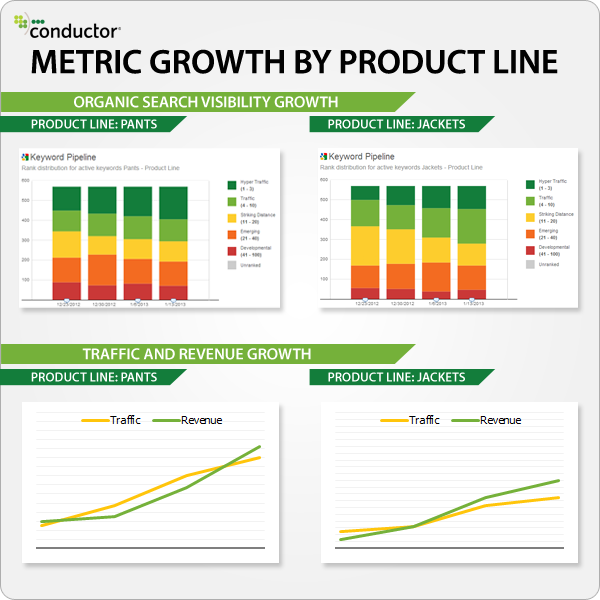 We’ll describe a “competitive analysis progression” she experienced, leading up to the point where she was able to successfully leverage competitive insight to grow her natural search metrics. At the beginning of her journey, Ann did very little competitive analysis. Once a week she checked on her handful of keywords in the search rankings and quickly scanned for her three primary competitors before getting back to her link building and on-page optimization activities. One day, on an afternoon where she was checking rankings during lunch and spending a bit more time with it, our hero Ann took a closer look at the search rankings for her keywords. Her jaw dropped when she noticed a pattern among many of her keywords that had previously escaped her notice. She had been operating largely on the assumption that Acme’s online competitors and brick-and-mortar competitors were one and the same. A closer look that day showed that that was not at all the case. (Those readers who might find it farfetched that she be so misinformed – it happens more often than you might think). Digging into the SERPs for more keywords, she finds that the pattern repeats itself: the competitors she thought she was up against, in many cases, were not always those around her in the SERPs. Further analysis, with the help of her trusty friend Excel, showed an even more interesting phenomenon: when she added a ‘product line’ column to her keyword ranking report in Excel, and “pivot-tabled” the domains for each product line, she found that while there was overlap, the competitors differed substantially from one to the next. Given the traffic and revenue growth from the target keywords she was seeing from the analysis, and with the knowledge that the manual process limited her awareness to only a small percentage of the overall competitive landscape, she developed a plan to research how technology might help her to scale her competitive insight. While the specifics of your own SEO scenario may not map exactly to Ann’s, consider deepening the competitive SEO analysis you do today. You may find that it will bear fruit in traffic and sales and make you a more informed marketer. And sharing both the traffic and revenue growth and competitive insight you gained may just make you a hero in the executive suite.